My family and I spent a lovely week on Cape Cod, Massachusetts recently. 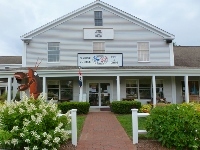 Our accommodations were in Dennisport (mid-Cape), a great base for visiting the area beaches, historic towns, hiking and biking trails, as well as the upper and lower Cape attractions. There were plenty of kid-friendly activities to keep my 12 year olds entertained including, hiking, biking, kayaking, go-carts and a few rounds of mini-golf. 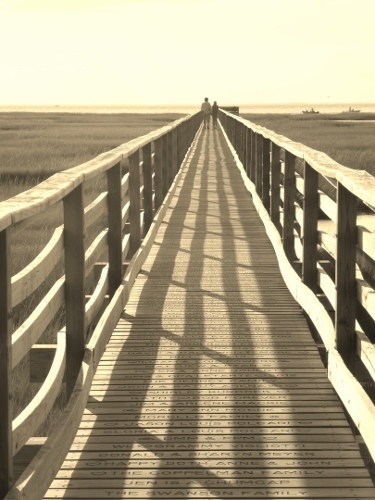 The entrance to Cape Cod National Seashore in Eastham (and ending in Provincetown) is nearby, where the 40 mile drive will take you past pristine shorelines, lighthouses, marshlands, kettle ponds, sandy dunes, and historic structures. Having spent time on the Cape before, I was already aware of a few gluten-free eateries in the mid-Cape area, but I did my research before leaving, and came up with a few new ones to try. All the restaurants noted below are casual, family-friendly and provided a safe, gluten-free dining experience (except for one … see below note). Chatham Fish & Lobster Co.
Chatham Fish & Lobster Co., 1291 Main Street, Chatham (my favorite!) View menu HERE. 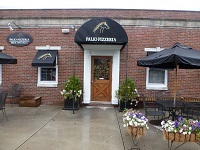 Palio Pizzeria, 435 Main Street, Hyannis (peanut free facility) View regular menu HERE. A Fan of Salt Water Taffy? While in South Yarmouth consider stopping along this roadside stand (984 Route 28) to fill a bag with sweet taffy! Select from over 30 flavors … cranberry, vanilla, root beer, strawberry, rum, watermelon .. the variety of flavors goes on. According to the workers, the taffy is made in a gluten-free (but not peanut-free) facility. Guapo’s Tortilla Shack, 239 Underpass Road, Brewster (second location in Orleans), View GF Menu HERE. Gluten-Free Options: Tacos, Unwrapped Burritos called Guapo’s Burro Bowl (Carne Asada Burro Bowl, Surf n’Turf Burro Bowl) and a few sides: Mexican Street Corn, Beans, Red Rice. Vegetarian options available. I ordered the Carne Asada Burro Bowl with a side of rice and thoroughly enjoyed it. There are only a few seats inside, but it is more enjoyable to sit outdoors on the picnic tables. Pet-friendly outdoors! Clancy’s, 8 Upper County Road, Dennisport View Gluten Free Menu HERE. 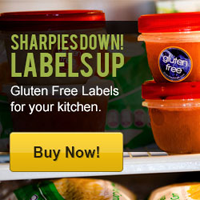 Many gluten-free items at Clancy’s, including clam chowder (yay! ), a nice assortment of salads, entrees and a few burgers and sandwiches, including a GF Lobster Roll. GF beer (Redbridge) available. 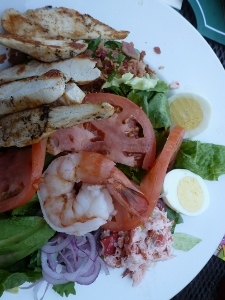 I ordered the Cobb Salad topped with massive portions of grilled chicken, shrimp, avocado, and lobster meat. The zinfandel vinaigrette dressing was light and delish (Lunch portion $15). If weather permits, I recommend sitting outside on the back deck which overlooks a serene, marshy area where you can watch kayakers paddling up river. Hit Pizza, 613 Main St. (Route 28) Dennisport View Regular Menu HERE. 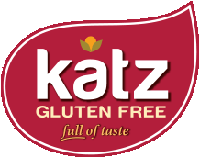 Gluten-Free Options: A few salads, and most of their specialty pizzas can be made gluten-free (they use French Meadow flour/dough). 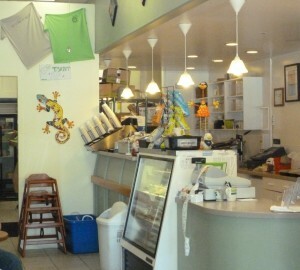 Kitchen staff was well aware of cross-contamination issues, and I felt comfortable eating there. Both BZ’s Pizzeria (see below) and Hit Pizza are near each other. If you want slightly more ambiance, and a few more GF choices, I would choose BZ’s. If you only have time for a quick salad/pizza, consider Hit. BZ’s Pizzeria, 682 Main Street, Dennisport View GF Menu HERE. 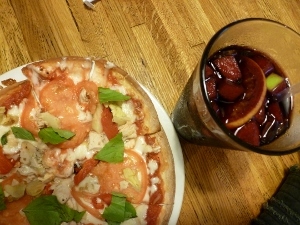 I had my first gluten-free pizza here years ago in this lively, family-friendly eatery. Gluten-Free options include homemade chili, pizza, nachos, fajitas & enchiladas, GF beer and a GF brownie available. Servers are knowledgeable and accommodating to special dietary eaters. Didn’t have a chance to go this time, but a good GF option if in the area. There are also numerous chain restaurants around the Cape offering gluten-free menus: Outback Steakhouse, Olive Garden, British Beer Company, Ninety-Nine to name a few. Do you have a favorite Cape Code gluten-free eatery? Please share below! Comment *Thanks to the above suggestions my family recently tried the GF lobster roll at Clancy’s. My husband is completely gluten intolerant and we were pleasantly surprised how delicious the GF roll Clancy’s uses was! By surprised, I mean we were convinced the kitchen gave us non GF rolls. Clancy’s GF sandwich rolls are the best we’ve had since being GF. We found out the owner also has celiac’s and is diligent about getting the best GF options for his patrons. I’m happy to say that we had a great meal with no ill effects! Comment * Hi! Since my celiac diagnosis a few years backs I was so happy to hear about the Chatham Fish & Lobster Co. for our yearly trips to cape cod. Last year however, I was very disappointed when I was told by one of the workers that they could no longer say that their fried seafood was gluten free because they did not have a designated fryer and fried other things that contained gluten. Do you know if this is true? Did I just encounter and employee that didn’t know or have their practices changed since you wrote this post? I would love any info you have – I’m heading to the Cape next week and would LOVE a fish fry. Thanks! Comment *The local Cape Cod radio station has an ad from Kreme and Kone Chatham that offers gluten free fried seafood. I spoke with Scott who says they have a separate mixing area , cooking facility and ventilation system just for the GF items. I’m headed there tomorrow and will report my findings. Great to know Bill, tell us about your experience … and have fun on the Cape! Comment *There is a great restaurant on Main St. in Wareham, a few miles before the Bourne Bridge. They have GF pasta and breadcrumbs. You can order ANYTHING on the menu and they will modify it. I have never been to such a GF accommodating restaurant. Most restaurants humor us with no changes but simplified, safe choices. Cafe Soleil is the place to go. Yum! Comment * Agreed!!!! 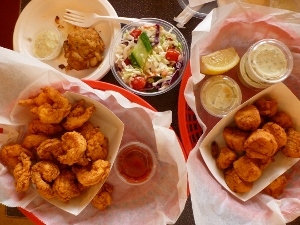 Idgy’s and Chatham Seafood are among my favorites! I travel to the cape often for family vacations from Western NY and look forward to visiting these. I look forward to trying Clancys for the lobster roll and my trip next week! Thank you for your suggestions! Thanks for your comment Sarah. Yes, try them all! I recently ate at Clancy’s – great view too! Comment *Thank you for all the great suggestions! We are planning to visit the area in October and your recommendations have helped a lot in the planning of this little get-away. The Hot Stove Saloon has delicious GF Pizza! ROUTE 28 HARWICHPORT, MASSACHUSETTS TEL: 508-432-9911. Located in the center of Harwich Port village, an easy walk from Bank St. beach, the Hot Stove Saloon opened its doors in May of 2005. The friendly staff and relaxed atmosphere along with 13 high definition flat screens, make it a fun place to catch a game or meet a friend. Decorated in a historic baseball theme we have tried to recapture an individual’s baseball memories when the game was fun and enjoyed by all. We have a vast collection of memorabilia throughout the restaurant, some of which dates back to the early 1900’s.